↑ Kam Wing Chan (2013年1月15號). "Misconceptions and Complexities in the Study of China's Cities: Definitions, Statistics, and Implications" (PDF) (用英文寫). 《歐亞地理學與經濟學（英文：Eurasian Geography and Economics）》. 喺2016年1月22號搵到. ↑ "World Population Prospects" (PDF) (用英文寫). 聯合國經濟社會事務處（英文：United Nations Department of Economic and Social Affairs）. 2015年. 喺2016年1月22號搵到. ↑ 3.0 3.1 Law of the People's Republic of China on the Standard Spoken and Written Chinese Language (Order of the President No.37). 中華人民共和國政府. 2000年10月31號 [2016年1月22號] （英文）. ↑ 中華人民共和國主席令. 中華人民共和國政府. 2005年9月31號 [2016年1月22號] （大陸簡體）. ↑ Tabulation of the 2010 Census of the People's Republic of China. 中華人民共和國國家統計局. [2016年1月22號] （英文）. ↑ 第五屆全國人民代表大會. CONSTITUTION OF THE PEOPLE'S REPUBLIC OF CHINA. 人民網. 1982年12月4號 [2016年1月22號] （英文）. 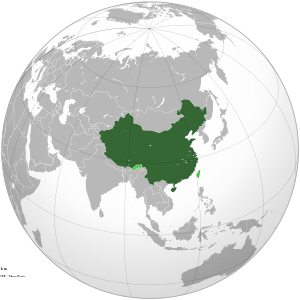 ↑ Constitution of the People's Republic of China. 中國人大網. 2004年3月14號 [2016年1月22號] （英文）. ↑ 8.0 8.1 8.2 國際貨幣基金組織 (2016年4月). "China" (用英文寫). 《全球經濟展望（英文：World Economic Outlook）》. 喺2016年5月22號搵到. ↑ 聯合國開發計劃署 (2014年). "2015 Human Development Report" (PDF) (用英文寫). 《人類發展報告（英文：Human Development Report）》. 喺2016年1月22號搵到. ↑ "China's Economy Realized a Moderate but Stable and Sound Growth in 2015". National Bureau of Statistics of China. 2016-01-19. 喺2016-06-20搵到. Taking the per capita disposable income of nationwide households by income quintiles, that of the low-income group reached 5,221 yuan, the lower-middle-income group 11,894 yuan, the middle-income group 19,320 yuan, the upper-middle-income group 29,438 yuan, and the high-income group 54,544 yuan. The Gini Coefficient for national income in 2015 was 0.462. ↑ 倪惠. 甘犁：房價崩潰對普通家庭具災難性影響. 網易. 2014年9月15號 [2016年1月22號] （大陸簡體）. "Ministry of Foreign Affairs Singapore" (用英文寫). 星加坡外交部（英文：Ministry of Foreign Affairs (Singapore)）. "China - Department of Foreign Affairs and Trade" (用英文寫). 澳洲外交貿易部（英文：Department of Foreign Affairs and Trade (Australia)）.